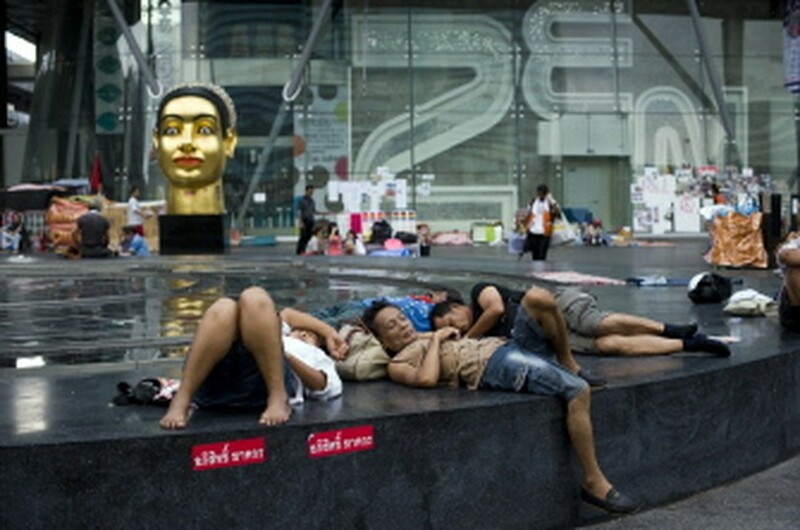 BANGKOK, May 3, 2010 (AFP) - Thailand's premier said Monday he would unveil a political roadmap to end a tense standoff with opposition protesters following the country's deadliest civil violence in almost two decades. But the authorities said they were still planning an operation to disperse the anti-government "Red Shirts", who have been occupying parts of the capital since mid-March in their campaign for immediate elections. "I will present a political solution or roadmap" out of the crisis, Prime Minister Abhisit Vejjajiva said in parliament. He said the outcome needed to be acceptable to the entire country, not only to politicians or the protesters. Abhisit said he hoped to announce the roadmap within the next few days but it was unclear whether his plans would be enough to persuade the thousands of Red Shirts on the streets of the capital to end their rally. "This conflict and the situation cannot simply be resolved through force," he said separately in an interview with Japanese media. The mostly rural poor and urban working class "Red Shirt" protesters have occupied parts of Bangkok since mid-March in their bid to topple a government they see as elitist and undemocratic. There have been a series of tense confrontations between the demonstrators and the security forces in Bangkok, where 27 people died and nearly 1,000 were injured in civil unrest last month. The Red Shirts have reinforced roadblocks and stepped up security checks on the perimeter of their sprawling protest site, which has been fortified with barricades made from piles of truck tyres, razor wire and bamboo stakes. Abhisit last month rejected a compromise offer by the Reds to disperse if elections are held in three months' time, and the protesters have reverted to their original demand for snap polls. "I have never ruled out House dissolution but not today or in 15 or 30 days as requested by the protesters," Abhisit said Monday. The premier offered in March to hold elections by the end of 2010 -- one year ahead of schedule -- to end the bitter stand-off, but protest leaders rejected the proposal. Abhisit's deputy, Suthep Thaugsuban, said elections would come only after order is restored. "When the prime minister is confident that the country has no conflict and everyone will follow the rule of law, he can decide to dissolve the House and have a new election," he told reporters. The authorities have repeatedly said they plan to retake the protest site without disclosing when. A failed attempt by the army on April 10 to clear another area in Bangkok's historic district of demonstrators sparked fierce street fighting that left 25 people dead and hundreds injured. "The operation must end the entire problem, not cause other small problems," said army spokesman Sansern Kaewkamnerd, adding that security forces would use armoured vehicles to retake the area. "The armoured vehicles will provide safety for the authorities and protesters as there are armed groups at the protests. Armoured vehicles will reduce losses for both sides," he said. Many of the Red Shirts seek the return of former prime minister Thaksin Shinawatra, who was ousted in a 2006 coup and now lives overseas to avoid a jail term for corruption. The movement has faced heavy criticism after about 100 supporters raided a hospital Thursday evening in the mistaken belief it sheltered security forces preparing a crackdown. The think-tank International Crisis Group has urged Thailand to consider mediation help from other countries to avoid a slide into "an undeclared civil war".